In Shoreham-by-Sea there is a pub called The Duke of Wellington. I've never been in it, possibly on account of the factor that I am about to relate. Above the door is a very large stone boot. This is presumably a Wellington boot. 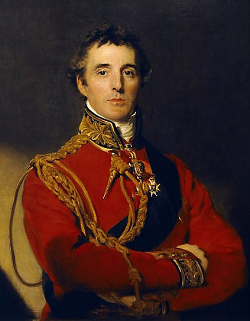 Maybe it's even one of the Duke of Wellington's very own. He was an impressive man, after all, and ate a lot of beef. But this great big stone boot hangs there all the same. Sometimes I have to walk under it as it overhangs the pavement outside the door. And this always worries me. It is only suspended by chains, you see. Should they ever fail, that boot will fall earthward with terrifying force. If I know only one thing about physics - and I do - I know this: stuff that is up in the air will always want to go in a downward direction. This is because Sir Isaac Newton invented gravity. One day I'll be underneath that boot and it will fall on my head, I just know it. I tell you what I will do to prove this to you. I'm going to go there right now and stand there. I'll stand there for a thousand years if I have to. But one day I'll be underneath that boot and it will fall on my head. And that will be just my bloody luck.